At the beginning of the year I was introduced to the idea of a “Daniel Fast.” I had always thought of fasting as being abstaining totally from food, such as when Jesus fasted for 40 days in the wilderness. But I didn’t realize that partial fasting is also in the Bible. Moses fasted while waiting to receive the 10 commandments (Exodus 34), David fasted while praying for his dying child (2 Samuel 12), Esther and the Jewish people in the city fasted before she went in to talk to the king (Esther 4), and as mentioned earlier, Jesus fasted for 40 days in the wilderness where he was also tempted by Satan (Matthew 4). These fasts lasted various amounts of time, from 3 days of fasting in the book of Esther, to a full 40 days of fasting for Moses and Jesus, in which they neither ate not drank, but were supernaturally sustained. The prophet Daniel also fasted, saying, “Then I turned my face to the Lord God, seeking him by prayer and pleas for mercy with fasting and sackcloth and ashes” (Dan 9:3). In Daniel 10 we find that Daniel fasted by eating “no delicacies, no meat or wine entered my mouth, nor did I anoint myself at all, for the full three weeks” (Dan. 10:3). So in this case Daniel’s fast was a partial fast, wherein he ate plain food and water, no meat, delicacies or wine, for 21 days. So during a “Daniel fast” a person does a partial fast, abstaining from things like meat, sugar and sweeteners, bread made with yeast, dairy products, refined or processed foods, etc., and instead eats fruits, vegetables, whole grains, beans, nuts, seeds, and so on, using the time of fasting to focus not on physical food but spiritual food. Taking time to really seek the Lord in Bible study and prayer, in order to deepen that relationship with Him. 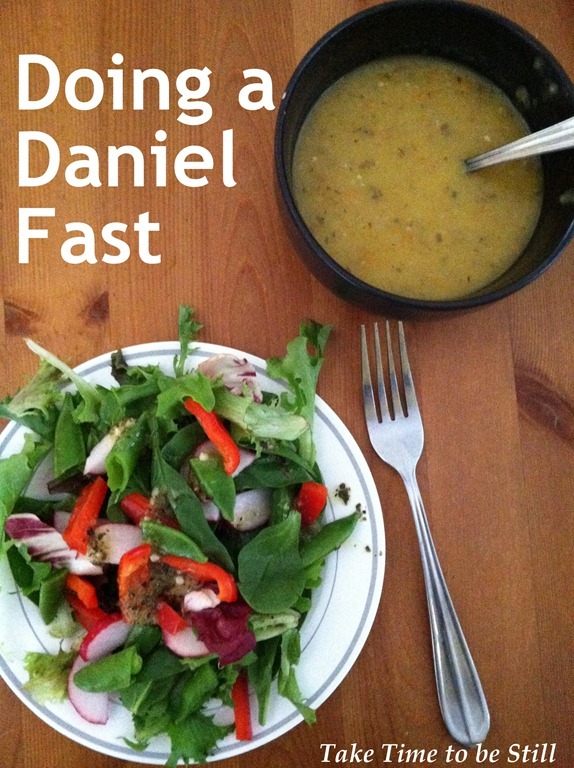 I have decided to participate in a Daniel fast in preparation for Easter, based on the guidelines in The Ultimate Guide to the Daniel Fast by Kristen Feola. Like the Advent season at Christmas time, I want to spend the weeks leading into Easter focusing on Christ’s sacrifice for me. This is just one way to prepare for Easter, and I will share my experiences with it soon, as well as why I chose this particular kind of fast, but there are lots of other ways to prepare our hearts for Easter too. What are some things you are doing to get ready for Easter? This entry was posted in Midweek Inspiration and tagged Daniel Fast, Easter, Fasting, Midweek Inspiration by Julia. Bookmark the permalink. Wow, I really admire you. It sounds like a very healthy diet for your body too. Yes, it is a very healthy diet as well. I hope some of the good eating habits stick in the long run!